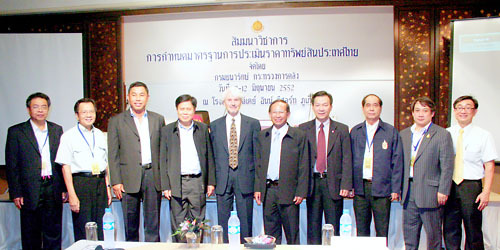 Mr.Thevan Vichitakul (the fifth from the right), Director General, the Treasury Department, the Royal Thai Government delivered an opening speech to the Seminar on Standardizing Real Estate Valuation with Computer-assisted Mass Appraisal (CAMA)in Thailand. 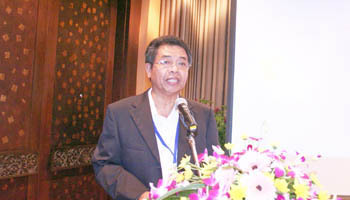 There were speakers from different countries who did the CAMA to present papers. 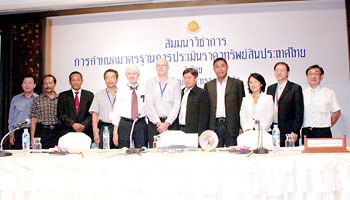 They are the Commissioner of the Rating and Valuation Department, Hong Kong, Valuer General, the Victoria State, Australia, professors at the University Technology Malaysia who conducted the CAMA for the Depaartment of Valuation, Malaysia and the CAMA Specialist from the International Association of Assessing Officers, USA.The Department appointed the Thai Appraisal Foundation represented by Dr.Sopon Pornchokchai, the president of the Foundation to conduct this seminar.